Everything is instant and we’re all connected globally. So what happens when our Twitter feed has the potential to ruin our night of television? It’s a new phenomenon but it’s something that raises concern. Back in my Myspace blogging days, I’d wait to post a review blog on TV show until the west coast had aired it…and even then, the title and the first five lines of the blog would read: SPOILERS!! STOP RIGHT THERE!! giving the reader plenty of warning. Where’s the warning on our Twitter feed? How about Facebook? I made the mistake last week, during the episode of Glee, to Tweet lines while watching the show live. Realizing my mistake, I then tweeted @ those users that I knew were watching it at the same time but then you run into the problem of having common friends who can still see your Twitter feed. Even if you give fair warning, the instant Twitter feed will quickly bury your warning tweet. If a friend is following 500 people, your tweets probably won’t stand out too much but what if you’re just one of 20? Posting REACTIONS are different than actually narrating the show itself. “Whoa, what just happened?” will incite excitement and anticipation for the friend who has yet to watch the episode over “Wow, I cannot believe she just threw a rock in his window!” will make them resent you for ruining a surprising moment. 1) Find out which of your readers watch the same shows you do. Send out a poll tweet to get an idea. 2) Be aware of the time zones that your friends live in. 3) Use your direct messaging. Keep the spoilers out of the public timeline. 4) Give reactions to the show without giving away plot details. 5) On Facebook, consider opening up a running note to talk about the show with those watching it at the same time, instead of posting status messages. 5) ENJOY THE SHOW! You can tweet/facebook about it the next day! A Tweet is not a blog…There’s no where to bury the content. Remember that as excited as YOU are to watch the new episode of your favorite show, so is everyone else who is a fan. We’re all busy people with very different schedule. We integrate our lives with each other instantly on Twitter & Facebook…Let’s extend the consideration and remember the golden rule: NO SPOILERS. Is this a problem that you’ve run into? Do you have any other tips/suggestions/complaints? .-= Anita´s last blog ..In Memorium =-. Yeah, I know that in Turkey, the shows are about a season behind…For soap operas, they were about 3 years behind…lol. If I could [X] Like this blog, I would. .-= LivingWicked´s last blog ..Tipping is Not a City in China… =-. 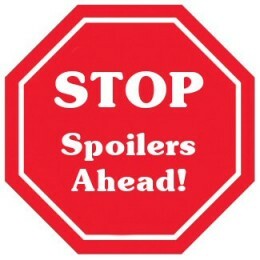 I am a firm believer in “no spoilers” especially on Facebook and twitter–with limits. I will tweet “about” a tv show I’m watching, but only in vague terms of liking/hating it, saw that plot twist coming, or more often I’ll write about the ads. I keep my virtual group tv watching confined to instant messenger, so I can be sure not to ruin it for anyone else. Unfortunately far too many twitter users don’t realize that they might spoil a show for someone that isn’t able to watch yet. Or they don’t care that live-tweeting an event is one of those things that “breaks” twitter–like if everyone’s watching the Emmy’s and tweeting the same things at the same time, you’re really going to annoy that one common follower that isn’t. But I do have limits. If a weekly show aired more than 72 hours ago, or a week-long series aired more than a week or so ago, I have no problem tweeting about it or reading about it even if I haven’t watched it myself. We can respect each other in real time, but after a certain amount of time passes I don’t consider it spoiling just because a (virtual) friend hasn’t gotten around to watching something sitting on their DVR. .-= urban bohemian´s last blog ..food: White House Farmers Market =-. I agree with the limits…72 hours is a legitimate time limit…I would probably only wait for 48…lol. Well, the problem with the Twitter/Facebook feeds is that sometimes they’re hard to filter so a tweet that could be a spoiler could catch my eye without even realizing. I completely agree. I was tempted to plurk something about The Big Bang Theory last night, but I refrained because I didn’t want to ruin it for any one else. As someone who watches almost no live TV, just from my DVR, I’ve made it a point to just stay off of Twitter during the times of the shows I know I want to watch later. But I would argue that I don’t see the point of live tweeting a TV show. Doesn’t that take away from your experience of watching? Plus I would say it’s uber-annoying for the people that could care less about what you’re watching and would like to just Tweet happily without reading a running commentary of something that, if they chose, they could be watching themselves. .-= Rachel´s last blog ..Giveaway! =-. Well, for me, it’s more about sharing the experience of watching? But I agree…it shouldn’t be all on Twitter. Shows like Glee that don’t require a lot of ‘focus’ are easier to live tweet and share with people…the funny lines, etc. I really couldn’t care less about the people on the West Coast. I harbor a bit of animosity that sporting events end at ungodly hours over here so that they can see the beginning. If they get a spoiler on a show, that’s just too bad and it’s a trade off. This actually only bothers me when the show is a dramatic one. For instance, I do NOT want to know what happens if I’m 20 minutes behind while watching Lost, but Glee? Sure, I love the show, but it’s not exactly a suspenseful one. I just try to roll with it. I always try to avoid ruining shows for others, though. .-= shine´s last blog ..Oh, they’ll pick you up all right. But then they’ll bend you right over that counter without even buying you coffee first. =-. Great ideas, also you gotta watch out about spamming the Twittersphere sometimes, don’t tweet every 5 seconds. .-= Patrick´s last blog ..Metblogs Round-Up: 9-21-09 =-. I haven’t run into this issue as I do live on the East Coast, however, I need to be more mindful of those who do not. I suppose I likely do this with Project Runway. Personally, if I’m unable to watch something and suspect people will be tweeting about it, I simply don’t read my twitter feed. That way I avoid spoilers. But I guess it’s going to happen regardless. I was reading something the other day about Twilight versus True Blood and had the third Twilight book spoiled on me before I even got to that point. Big bummer. Guess you can’t avoid everything all the time though. .-= MinD´s last blog ..Specifically. =-. I’m not usually having a problem with spoilers, unless it’s really my favorite show then I feel like hitting the person. I just don’t tweet it, unless you know sometimes I cant help it if it’s a book with clear ending made into movies. You know how I feel about this particular issue…! In my ‘TV circle’ (if you use torrents, you’ve probably used some of mine) — it’s sacrilege to spoil within a _month_ of a show airing. But yes, I normally go for the 12-18 hour rule — long enough for people to wake up and watch it the following day. .-= Sebastian´s last blog ..Saturday is Dollhouse Day! (Formerly: Dushku Day!) =-.